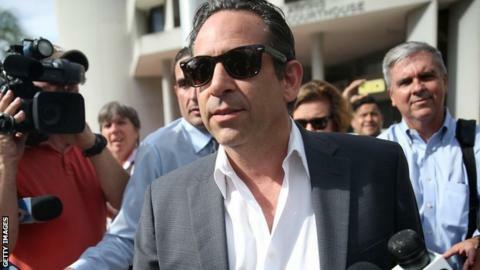 Anthony Bosch, the former owner of a Florida clinic at the centre of baseball's most recent steroid scandal, has been jailed for four years. He pleaded guilty in October to conspiracy to distribute testosterone to athletes from the now-closed Biogenesis of America clinic. One customer was New York Yankees star Alex Rodriguez, who was suspended for 211 games in August 2013. The ban was cut to 162 games on appeal but he missed the entire 2014 season. Thirteen other players were also suspended, with bans ranging from 50 to 65 matches. Bosch and Rodriguez are both expected to testify if Rodriguez's cousin Yuri Sucart and ex-University of Miami pitching coach Lazaro Collazo go on trial, for conspiring to distribute steroids, as scheduled in April. Rodriguez, the 14-time All-Star and three-time Most Valuable Player, issued a handwritten apology for his involvement in the scandal. "I take full responsibility for the mistakes that led to my suspension for the 2014 season," he wrote. "I regret that my actions made the situation worse than it needed to be. To Major League Baseball, the Yankees, the Steinbrenner family, the Players Association and you, the fans, I can only say I'm sorry." The most dangerous job in sport?